Freshly cut timber which has not been dried and typically has a moisture content of over 30% is referred to as “green”. Green English oak is good to work with and has the wonderful property of hardening as it ages. 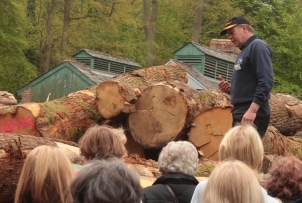 During the natural drying process over a number of years oak will be subject to some shrinking, warping, twisting and splitting, particularly during the summer months. This is the nature and beauty of green woodworking. With well-designed traditionally made products and carefully selected timbers it means the integrity of the countryside furniture is not affected and they will give many years of service. Milled timber which has been air dried by exposure to natural atmospheric conditions. Air drying is a slow process which takes many years depending on the thickness of timber. The resultant timber is much more stable than green timber and has lower moisture content (circa 20%). Air dried timber is often referred to as “semi-seasoned timber”. Kiln drying is used to reduce the moisture content of timber in a controlled (heat, moisture, ventilation) environment. At NPWP we air-dry English oak before further drying in our kiln. The kiln environment is carefully controlled and the timber monitored during the timeit takes to gradually reduce the moisture content. The kiln-dried timber produced has a 10 - 12% moisture content which is best suited to the English outdoor climate (not suitable for centrally heated houses). The kiln-dried English oak is used in our carpentry workshop to produce our premium range of benches and products. 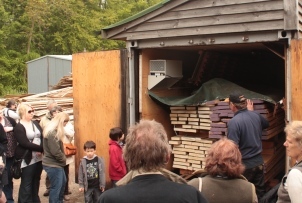 The kiln is heated by a wood burning eco-boiler using our workshop offcuts. 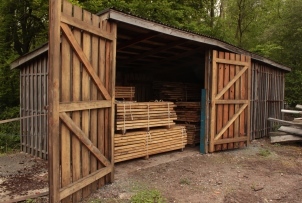 We are proud of our environmentally friendly approach and strive to use of every part of our valuable timber resources. Our traditional securing kit comprises two galvanised metal bars which are bolted to the legs/frame of the bench and buried/cemented into the ground. 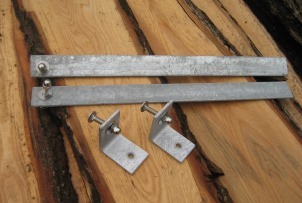 For bolting on to an existing base we have a right angle galvanised metal securing kit. Both kits are supplied with two stainless steel nuts, dome headed bolts and washers for fixing to the bench. NB Ground fixings are not supplied with the right angle securing kit as these will need to be chosen to suit the surface you are fixing too. One of the most popular methods of personalising a product is by inscribing a personal message or name. 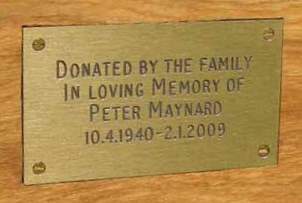 This is done by either routing directly into the wood, or inscribing a plaque and then mounting it into a rebated area of the wood. Personalising a NPWP product can be achieved by routing logos, symbols and text directly into the timber using our top of the range CNC machine. We will be pleased to advise the most suitable fonts, type sizes and layout. A proof will be produced and emailed for your approval. A range of typefaces and stock symbols are readily available. Alternatively we can create suitable routing templates from your logo or design ideas. 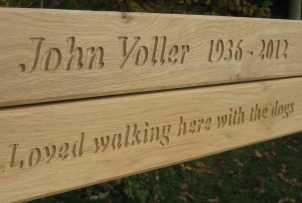 Routing directly into the wood is also an added deterrent as the bench is less likely to be stolen. Our faux brass plaques remain bright and readable (unlike real brass). They are suitable when the text will not fit on by routing into the timber. We are also happy to rebate and affix customer supplied plaques.